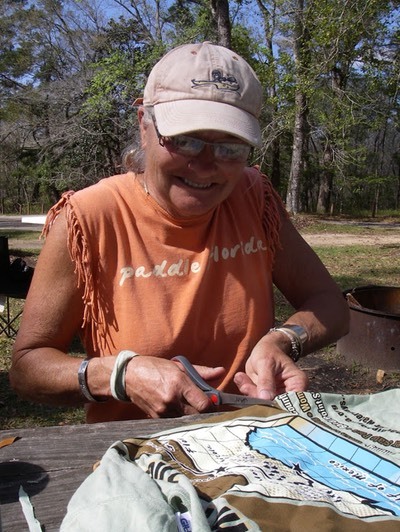 Author of several books on Florida's outdoors and history, ecologist, naturalist, historian and great story teller. See Doug's part of our story below. I updated my old slow computer. That is mostly a good thing. But a software program that I used to edit my videos will not work with my new operating system. I loved the old program because it was flexible and easy to use. It's replacement is clunky and not at all intuitive. I know what I want to do, but just can't do it with this program. So no videos until I figure out how to use the new program or find another one to replace it. Most of the photos used here are mine. 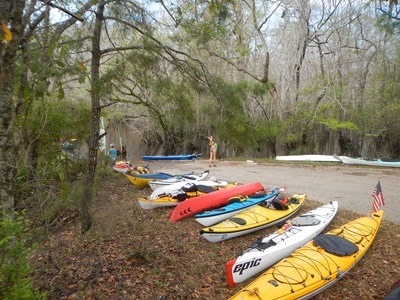 A few were taken by other paddlers and posted in a collection for us to view and use. Unfortunately, the photographer of each picture was not identified so I cannot give credit where credit is due So thanks to those anonymous donors whose photos were used here. Checking out, checking in, yawn! 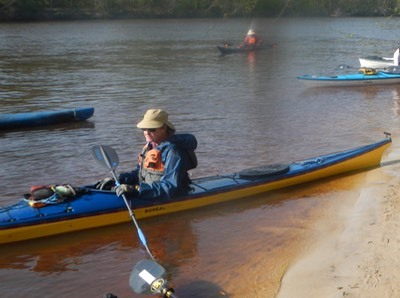 Why do I take these Paddle Florida Trips? First, I don't really like day trips. 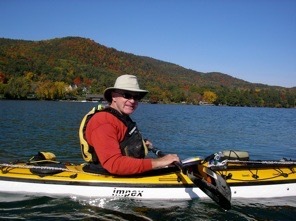 It takes almost as much work to go paddle for three or four hours as it does to go away for several days. I much prefer multi-day trips. 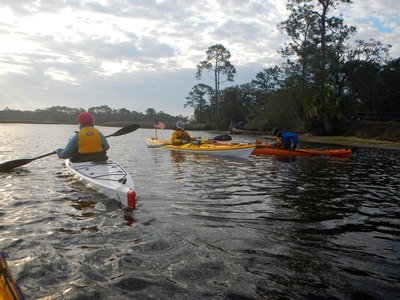 Second, Paddle Florida sponsors trips in each of the five water districts in the state. As a new Florida resident, I get to see parts of Florida that many old timers don't even know about. 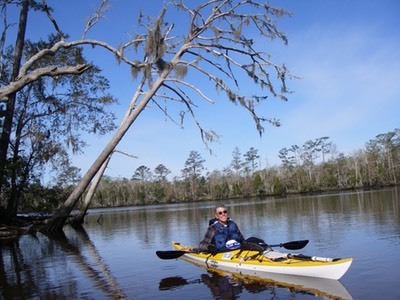 Without this (Ochlockonee River) Paddle Florida trip, I would probably never have had a reason to travel to Florida's Panhandle. 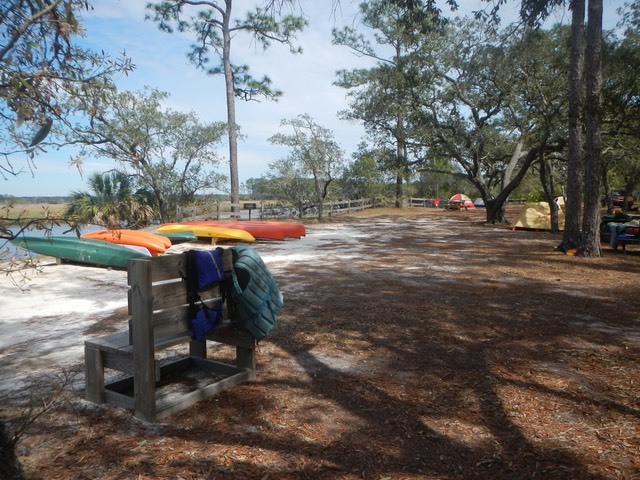 Third, a Paddle Florida trip includes all your meals, plans for accommodations, entertainment and transportation once you arrive at the launch point, and it does this at about half the cost of a trip with a commercial outfitter. Finally, and this is by no means least important, you meet and become friends with other paddlers from around the state and country. After several Paddle Florida Trips I feel that this more than anything else, keeps me coming back. 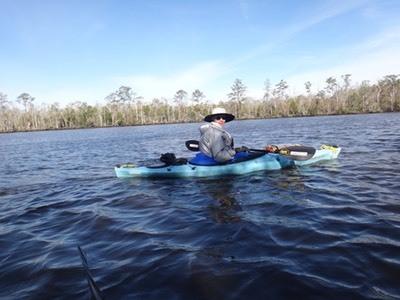 All the other Paddle Florida trips I've been on have provided relatively warm, dry days with moderate paddling conditions. This trip was different. 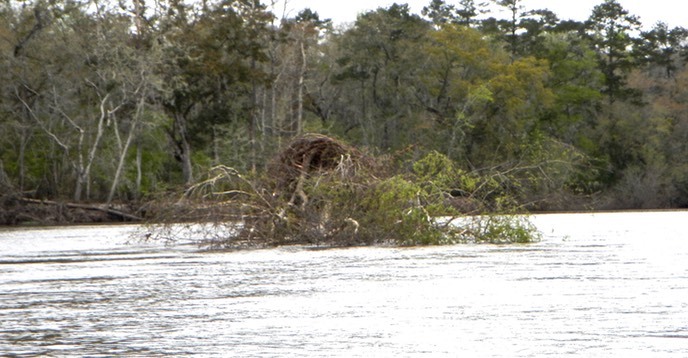 The Ochlocknee was still at flood stage after severe flooding just two weeks before. Even so, the river was been navigable. Great weather was predicted, but that's not what we got. We were not without our sunny afternoons, but the weather turned cold, overcast and rainy on many days. And then on the last day when we headed out into open water, the weather really turned against us. This is my report of that trip and the adventures we encountered. 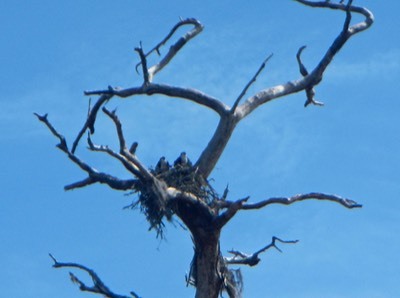 March 16 - Ed and Bernese’s Fish Camp: I arrived at Bald Point State Park on the Gulf of Mexico at about noon on March 16th, after a six plus hour drive from home. Bald Point was to be our end point for the trip. It was also where I picked up a shuttle to Ed and Bernese’s Fish Camp on the Ochlocknee, just below the Talaquin Dam. The Fish Camp was to be our first overnight stay and our launch point in the morning. Upon arrival we learned that there had been serious flooding in the area just ten days earlier. The Fish Camp had been under eight or ten feet of water. The water had receded but the ground was still damp, with high water stains showing on the bathroom building several feet over my head. As a result, the bathroom was out of order. Port-a-Potties had been provided for our use. 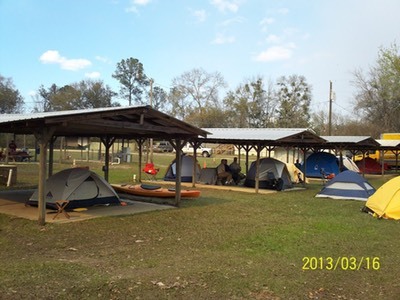 Many people pitched their tents on the concrete slabs of the covered pavilions. The river was still at flood stage and the current was moving fast. Our trip was through the least populated county in the state of Florida. Camping was to be close to “primitive” for most of our trip. Cell phone and internet service was unreliable to non-existent for most of our journey. At dinner we met Doobie, the lone survivor of the Doobie Brothers Catering Service. Doobie and Steve (a.k.a. Sugar) would be with us at every camping stop on the trip. Doobie was the stereotype of a Florida Redneck, and I say that with love in my heart. 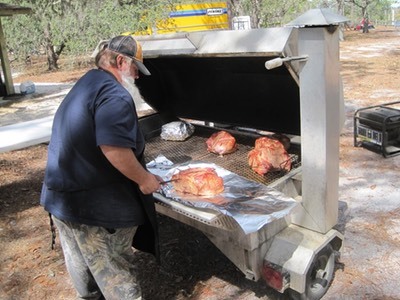 He was a good and gentle man and provided us with great food cooked on the spot under some really primitive conditions. Doobie stood about 5’8”, had a full beard and no teeth that I could see. He weighed at least 300 pounds and had a love of “camo” clothing (maybe he thought it was slimming). 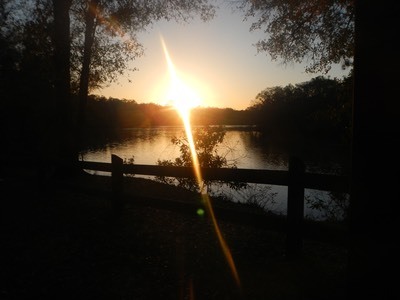 March 17 - On to Huey P. Arnold County Park in Liberty County: Because I had left home at 5:15 AM, I turned in early on Saturday night to sort equipment, read a little and get some sleep. It was a reasonably comfortable night. Still I lingered in my sleeping bag till about 6:30, not wanting to leave its warmth for the cold I felt outside. 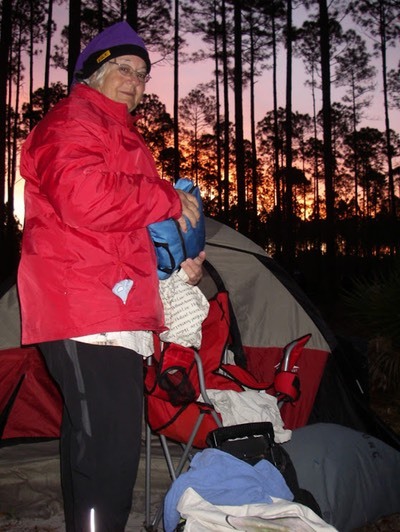 I went through my usual routine of packing up all the loose stuff in my tent before heading out for a cup of coffee. I joined the morning coffee klatch shortly after seven and stayed there till breakfast was served; grits, biscuits, scrambled eggs and, strangely, Kielbasa for sausage. Our launch window was 8:30-9:00. I was on the water at 8:45, trying to catch up with Doug Alderson (see sidebar) in our lead boat, a man who knew this river well. Air temperatures were cool, the sky was gray and overcast with no wind. The current was running fast, with water over flowing its banks everywhere. Trees that were obviously growing on dry land stood in the water. There were many trees knocked over and washed onto the river creating an unusual number of snags and strainers. Most of the trees were bare with only a very few just beginning to leaf out. I think that this combination of features had me feeling that this wasn’t a very pretty section of the river. A sunny day with lower water levels moving more slowly might have changed my opinion. But it was wild and remote. Eight miles and two hours into the trip we arrived at Stoutamire Landing, our lunch stop. The takeout was up a short side creek. It was a mucky landing and the creek was very deep. I had to exit my boat on one side as the water dropped off sharply on the other. Of course, I lost my balance and walked backwards into the creek till I regained my footing, chest deep in the water. I hoped that would be my one time for the trip! After lunch, the river narrowed some and became more winding. This made the river more interesting. However, the flood damage was even worse in this second eight miles of the trip. 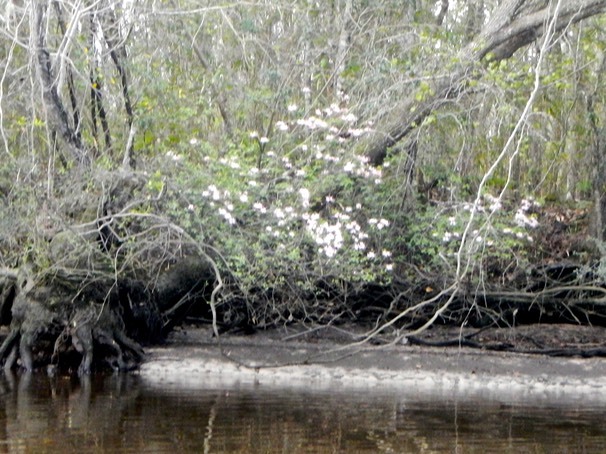 We even saw whole trees that had been washed away and deposited mid river, just beginning to bud. 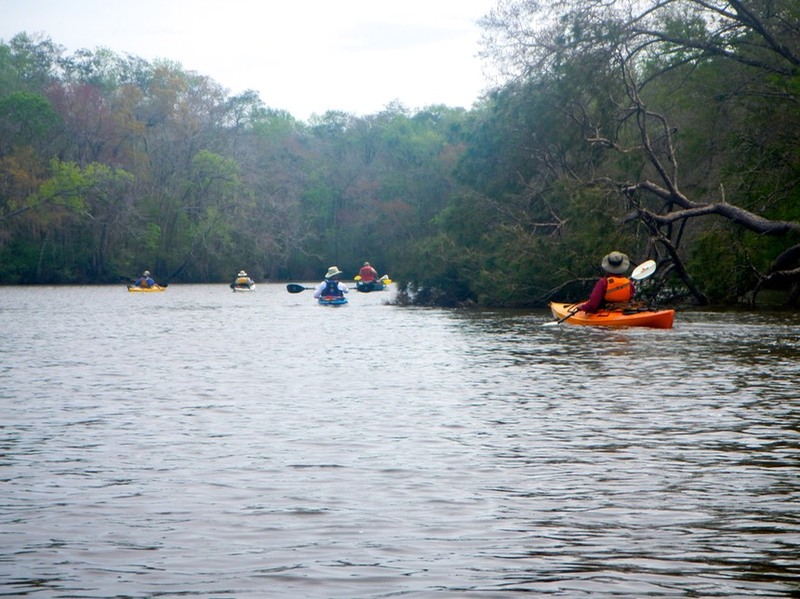 It became important to travel with other paddlers in view, but not so close as to bunch up in trying to negotiate snags and strainers. The rest of the trip was fast (because of the current) and uneventful. We passed a small creek with a covered bridge rebuilt by the Stoutamire family as a memorial to their parents who operated a river ferry there. I was disappointed that I saw no animals and only a few birds on this leg of the trip. I arrived at Huey P. Arnold County Park about 12:45. The skies were still gray and were now threatening rain. I got right to setting up camp, drying things out as much as I could, while still trying to get camp set up quickly ahead of the rain. The rain began about 3 PM. I crawled into my tent and buttoned it up. I took a short nap and began to make notes in my trip journal. That’s when I noticed that my tent was leaking - Bummer! This camp ground was primitive. The one small bathroom was augmented by Port-a-Potties. There were no pavilions or shelters of any kind, and no electrical power. There were however, racks for hanging dear and hog carcasses and tables to help with the butchering of this game. Clearly, we were not the folks this park was designed to serve! Dinner was held in the “Cafe Penske”, the empty cargo space of the large Penske truck used to transport all of our gear. Doobie served dinner from his cargo trailer/kitchen in “take away” boxes. 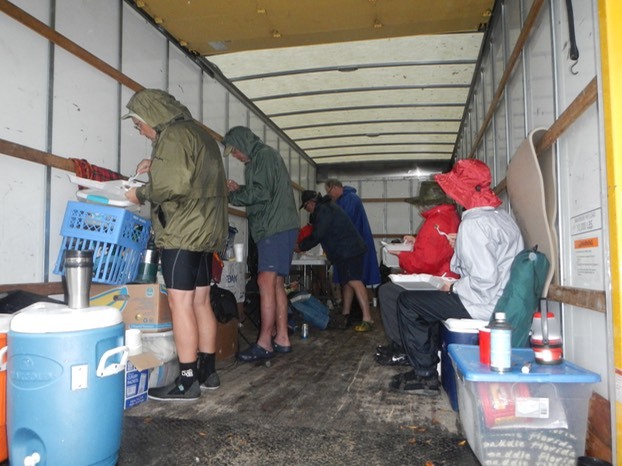 As the Penske was too full of diners, I ate dinner standing in the rain at a small table outside the truck. Such is the nature of a true adventure! 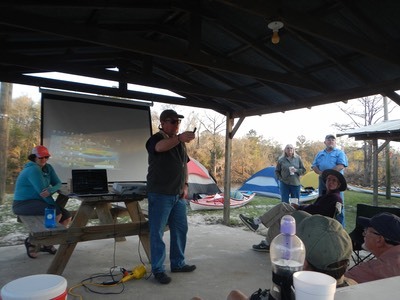 The rain continued to fall throughout the dinner hour and through Doug Alderson’s evening presentation on the Seminole Indians, based on his new book, The Great Florida Seminole Trail. Jan somehow managed to get a fire started despite the rain. 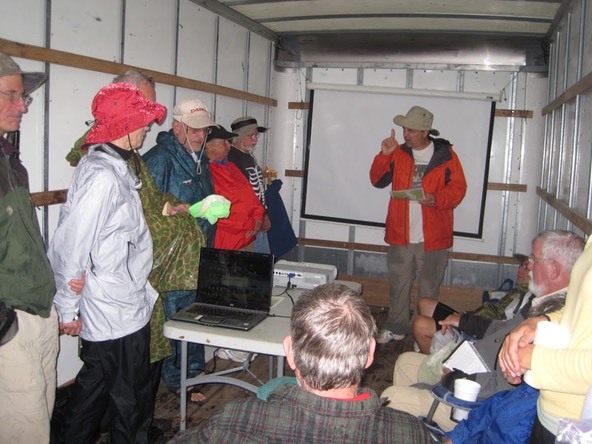 A small group gathered there after Doug’s presentation, but I had no desire to stand in the rain to be near a campfire, so I headed for my tent. I read for a while, then noticed that the rain had stopped just before lights out. 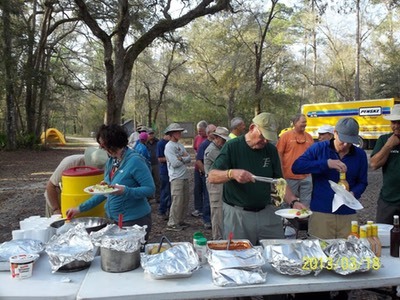 March 18 - On to Whitehead Lake Landing (Apalachicola National Forest): Breakfast was later this morning. I was up at 6:30 after a comfortable rain free night. Went through my usual pack-up routine the joined the coffee klatch. Because breakfast was at 8 AM instead of 7:30, I went back and packed up my tent. It was damp but not soaking wet. I was on the water at 8:45. 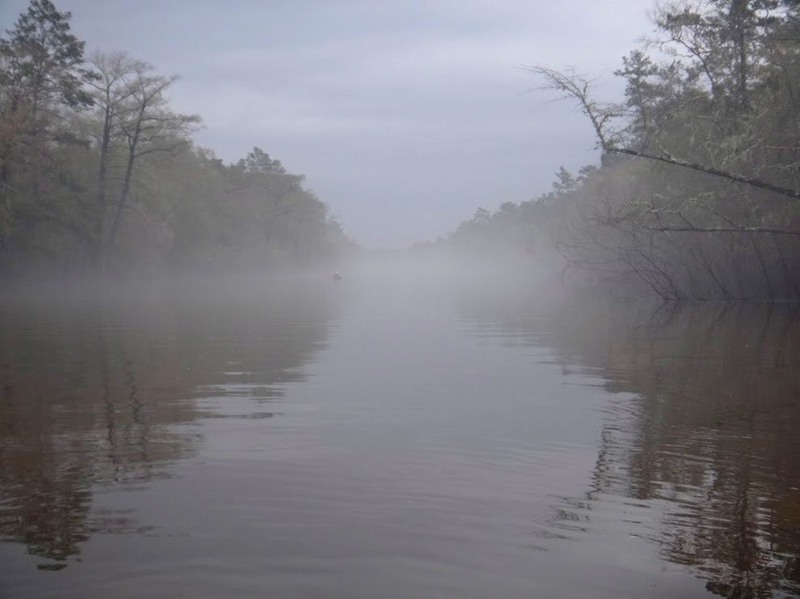 The day was overcast again with heavy fog shrouding the river and making it look beautiful in the misty morning light. The river seemed narrower this morning and the current faster. There were many more downed trees creating a labyrinth of snags and strainers. And still no wildlife. There were many new snags and strainers on the river. 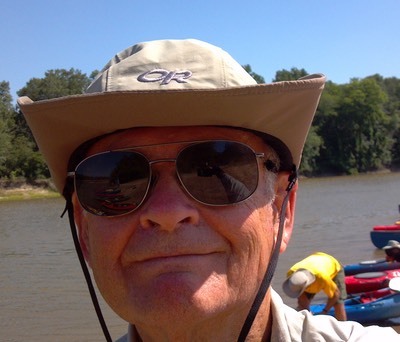 Two boats capsized in different sections of the river that day and I happened to be present at both. Hans went over when his bow caught a snag and the current swept him sideways into a strainer. It was a bit scary for awhile as he couldn’t seem to get a grip on his boat as the current was trying to push him under. Somehow a rear hatch cover came off and the rear compartment flooded. Eventually Doug Alderson and some others got him ashore and bailed out his boat. Hans was cold and shaken but otherwise alright. Lunch was at Jack Langston’s Fish Camp, a brief stop before heading back out on the fast moving river. Pat was the next paddler to go over. I was ahead of her and didn’t see what happened, but I think her story was much the same as Hans’s. I turned and saw her boat pinned agains a large strainer and she pinned against the boat with the current trying to push her under. Again, there was ample help around. Ed and Knox who were behind her quickly pulled ashore and tried to reach her. 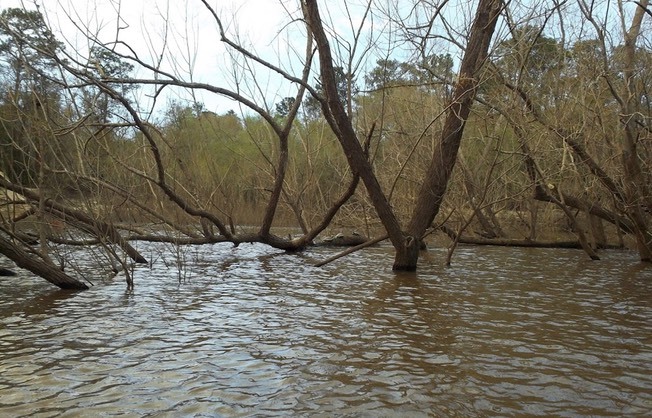 The river was maddeningly deep just feet from shore. Ed was in up to his armpits and still couldn’t quite reach her. Doug extended a paddle and once we could convince Pat to let go of her boat, she was dragged ashore. Again, shaken, cold, but unhurt, Pat helped bail out her boat, then changed into dry clothing and proceeded on down the river. I arrived at Whitehead Lake Landing, a short way up whitehead Lake Slough, at 1:30. I startled a medium sized gator as I paddled toward camp, the only one I’d see on the trip. Whitehead Lake Landing had been underwater not so long ago as well. The road from our landing to the campground was under about twelve inches of water that we traversed with our gear in hand to get to the campsite. The walk from launch site to camp. 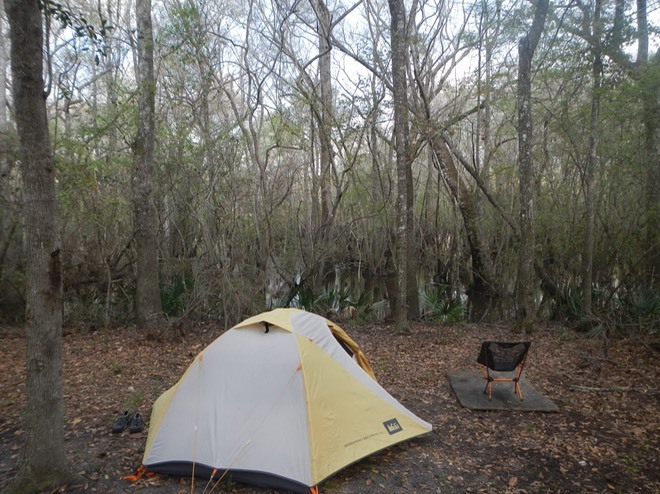 I set up camp as usual, this time near the edge of the overflowing slough. The day had gotten sunny. It was warm and slightly humid. 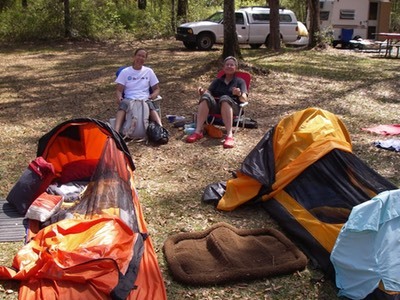 Several of us set up lines and were able to dry all of our damp tents, sleeping gear and clothing. This was Monday afternoon. My last shower had been on Friday night. I was feeling warm and sticky. Several paddlers had wandered down to the slough to swim and rinse off. I had not brought extra clothing that I wanted to get very wet, so instead of swimming, I packed a wash cloth and soap and went as far as the creek to stand in knee deep water for what amounted to a sponge bath. It felt really good. It was a leisurely afternoon in camp. 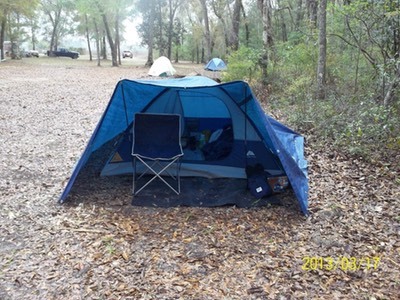 The ground was so soft from the flooding that the legs of my new camp chair sank in so far that I couldn’t use it. I discovered a washed up half sheet of plywood which became a base on which to set my chair. I sat there reading and writing in my journal till the urge to nap over took me. Then it was Dinner with Doobie and a presentation by the Langston family on bee keeping. Sounds kind of odd, but it was very interesting. Rain is predicted for tonight and tomorrow. We’ll see. March 19 - On to Mack Landing: The first thunderstorm rolled in sometime after 11 PM, announced by a roaring wind high in the slash pines and a significant drop in temperature. Bold flashes of lightening and heavy rain had me up, checking the tent for leaks and stowing things against water damage. Twice more that night a succession of storms marched through. Each time I considered whether I needed to escape to the safety of the big Penske truck to avoid electrocution. But while the storm passed close by, it never came directly overhead. So I slept fitfully until awakened by a barking dog and Doobie’s gas generator powering the lights needed to prepare breakfast. As with our previous campsite, there was no electricity here. 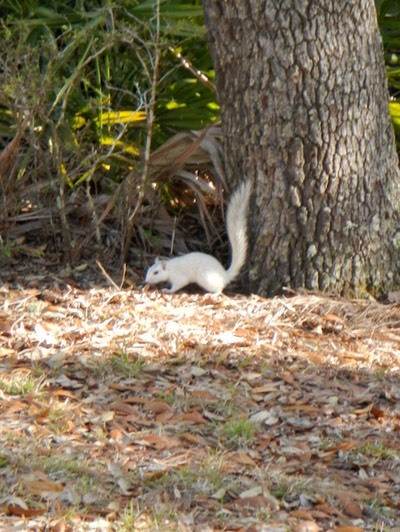 We were way out in the Florida wilderness! I packed up in the usual way, and dropped my tent using Scott Locorini’s method that keeps the interior of the tent relatively clean and dry, even when rain soaked. 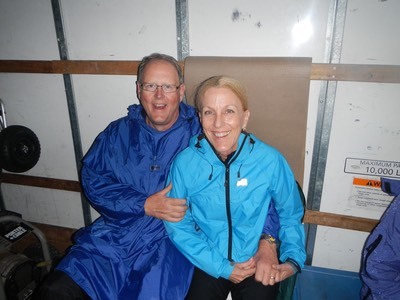 Thankfully the rain had stopped, so even though we had to pack up wet tents, we didn’t have to do it in the rain. Then I joined the klatch for coffee to warm up and have breakfast. 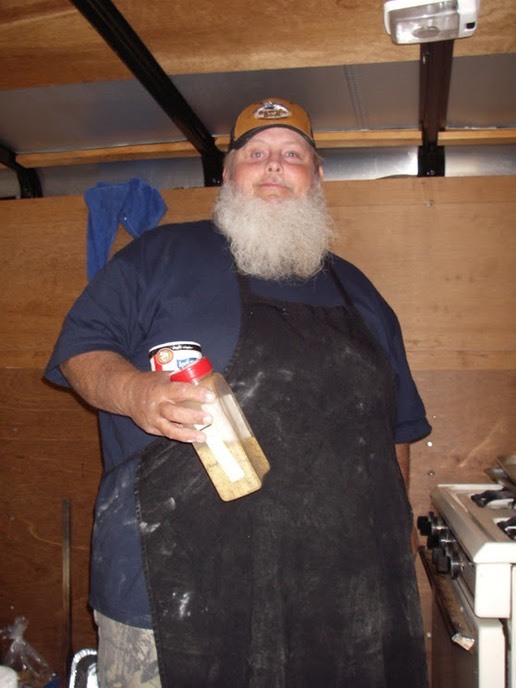 I think this was the morning Doobie served biscuits and wild hog gravy (yes, WILD HOG gravy direct from the Florida wilderness). It tasted great! I was on the river at 8:45. It was overcast but showed signs of clearing. Still I decided to wear my paddling jacket against the wind and possible rain. The river was even prettier this morning. It continued at flood stage, moving quickly. The trees were greener here than when we started. Was that because it was three days later into spring? Or was it that we were thirty miles or so further south? What ever the cause, it definitely made the river prettier and more inviting. We were paddling into spring! This part of Florida has a climate that is quite different from what I experience on the sub-tropical south Florida peninsula or in the Keys. It is a much more of a continental humid climate, similar to that of Georgia or Alabama. This difference extends to the flora as well. 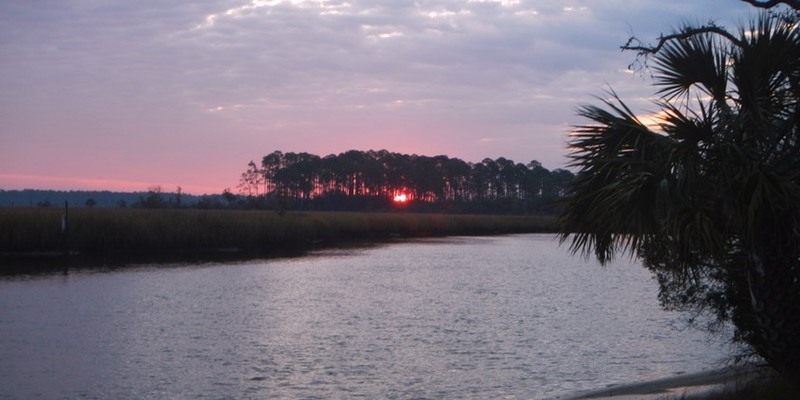 There are lots of Live Oak trees, Tupelo and Bald Cypress, Slash Pines an occasional palmetto and no palm trees. Yesterday I saw one palmetto. Today I have seen quite a few more. So as we move south toward the coast I expect to see more of them and maybe even a few palms. In the first few miles of today’s trip the river was narrow, winding and full of snags and strainers. Three of us came upon one seemingly impassable snag, a tree that had fallen completely across the river. 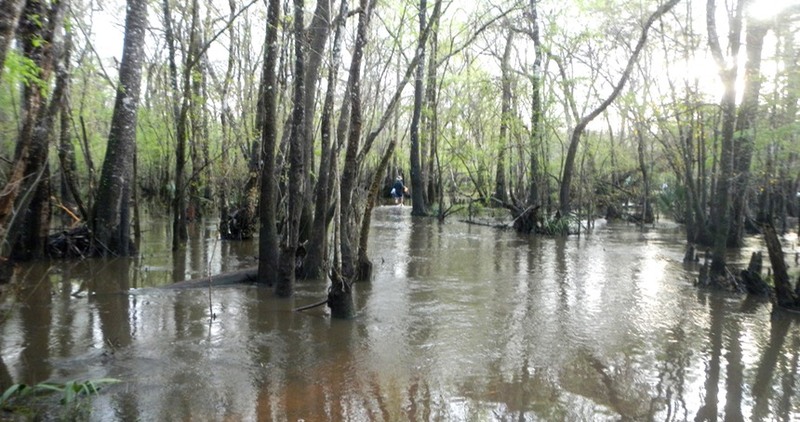 It looked like there were two possible ways through or around the blockage; try to maneuver through brush at one end or pass beneath the tree and over a limb supporting it just under the water. After investigating the possibilities, Ellie, who was in the lead decided to pass under the overhanging branch and over the submerged portion. The decision was not a bad one, as many subsequent paddlers made this choice and passed under without a problem. But Ellie was wearing an oversized PFD. As she leaned forward to pass under the tree, the collar of her PFD snagged on the overhang and she capsized. As with the other capsizes I witnessed, there were several people on hand to help in a rescue. Knox told Ellie to grab onto his boat. We had to convince her that I had her boat and she could let it go. He towed her to a place on shore where she could get out. 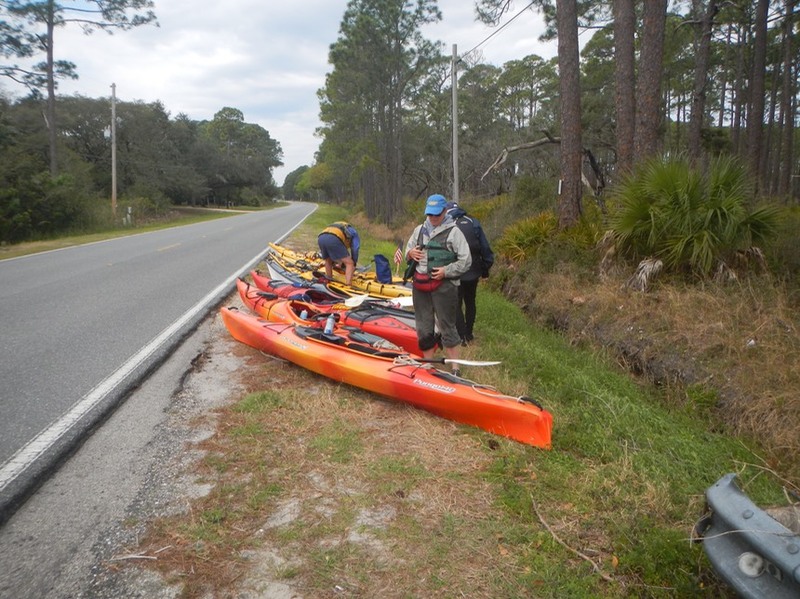 While the shore crew got her out of the water, another paddler assisted me in emptying her boat and turning it upright. 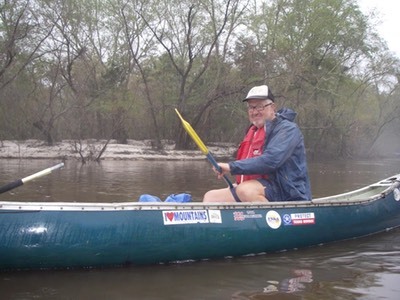 The current was rapidly sweeping me downstream, so I hooked on to Ellie’s boat with a short tow line I keep on deck and pulled her boat back upstream to where the shore crew could assist her in relaunching. Ellie was able to change into dry clothes at our Revell Landing lunch stop a short distance away. I believe there were two more capsizes that day. In every case, help was immediately available and thankfully, all the victims were wearing cinched-up PFD’s. 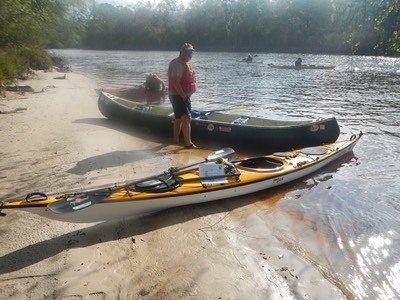 The fact that the water was not cold, that help was at hand and that people were properly equipped with PFD’s made these capsizes more of a learning experience than a hazard and added to our overall sense of adventure. After Ravell Landing, the river opened up. It became broader, less contorted and with fewer snags to be maneuvered around. The next six miles to Mack Landing on Mack Slough were pretty and blissfully uneventful. Mack Landing campground sits on a high bluff above the slough. 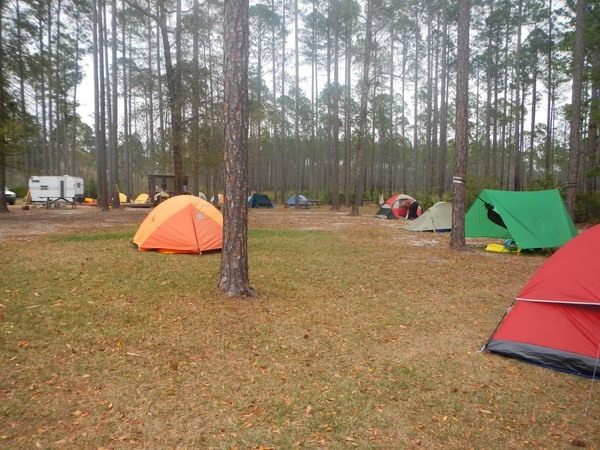 It is open and airy, with many tall Slash Pines, Tupelo and Live Oak trees. And there was warmth, sunshine and a slight breeze, perfect for drying things out. I pitched my tent near the edge of the bluff and sat in my new chair just taking it all in. Some journal writing, another sponge bath in the slough and Doobie’s dinner was capped by a video titled "We Are Water" on the importance of water in our lives. More rain and temperatures in the forties in the forecast for tonight. 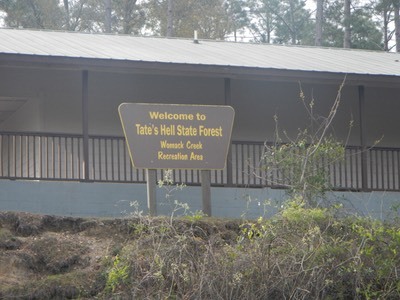 March 20 - On to Womack Creek in Tate's Hell State Forest: It was warmer than expected last night and we had no rain. I was up at 6:30 AM and started the packing routine. To my surprise the tent was bone dry both inside and out! I couldn’t remember if breakfast was at 7:30 0r 8:00 this morning, so at 7:15 I joined the coffee klatch and hung out till 7:40. When no breakfast appeared, I knew that 8:00 must be the magic hour. So I went back and finished packing up my gear. I was on the water at 8:40. The sky was again overcast with a cool wind blowing. I put on my paddling jacket against the cool wind and left it on all day. Temperatures never got out of the 60‘s. With the wind, it was cool on the water. We had brief periods of sun, but it was mostly gray and overcast. We were further south again today. The river was becoming wider and straighter as we approached the coast. There were fewer snags to contend with and the current, though still strong, was less obvious. We made it to our “lunch” stop at Log Cabin Campsite in just under two hours. I saw one turtle, a watermoccasin and a king fisher on this leg of the trip. Wildlife has been scarce. After lunch, Ed, in our lead boat and guide for the day, located the “shortcut” noted on his map. The shortcut was narrower with more turns, It was also very pretty. The shortcut saved us about 1.5 miles of paddling. 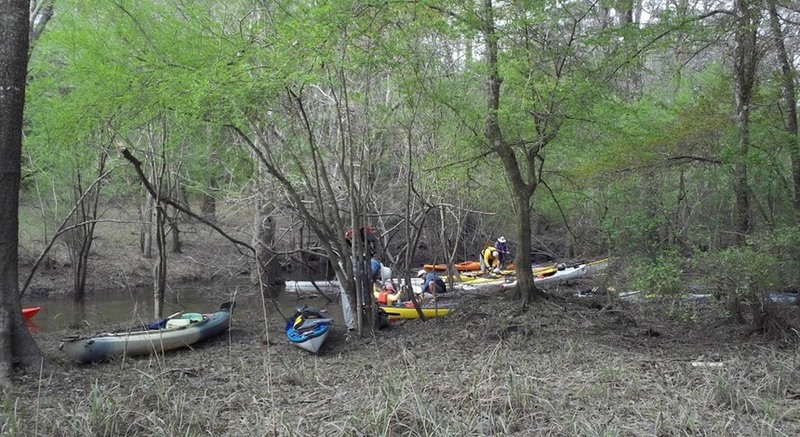 I noticed there were few if any obvious places to go ashore on the upper river. The banks, where you could find them, were very steep and the river dropped off quickly from shore making landings very difficult. 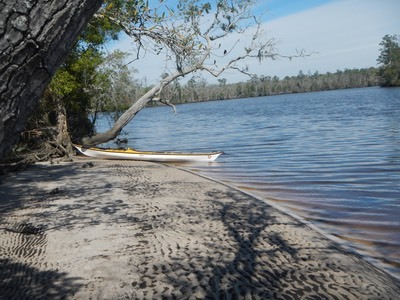 Today we began to see shallows with grasses and wildflowers, and sandy places where a kayak could land and a paddler go ashore. There were more palmettos and flowering trees in full bloom. And I even saw what I think I recognized as maple trees. Womack Creek Campsite was a short paddle from the end of the shortcut. 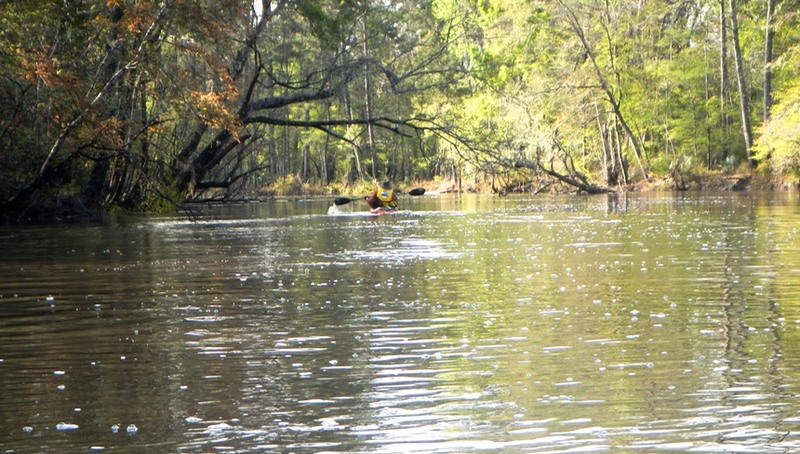 It is in a state forest that sits on high ground above the river in a mature open slash pine forest. 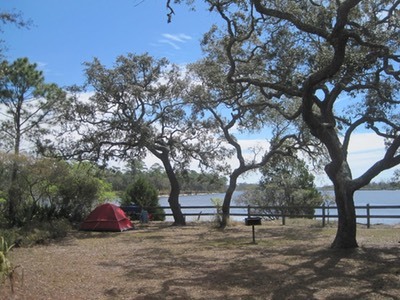 There are many separated campsites scattered across the bluff. And it had electricity (I could charge my cell phone) and showers! After setting up camp I escaped to take my first shower and shave in five days. It was heavenly. Doobie outdid himself this night with fried fish, hushpuppies and cheese grits for dinner and peach cobbler for desert. Grant Peeples provided our entertainment that night, Grant is a great in-person performer. 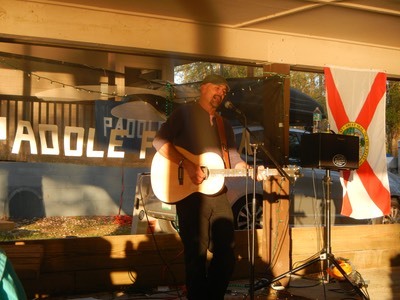 He gets lots of audience participation and tells great rural Florida stories as background for his songs. I really like his stuff. Check out the video below for a sample. 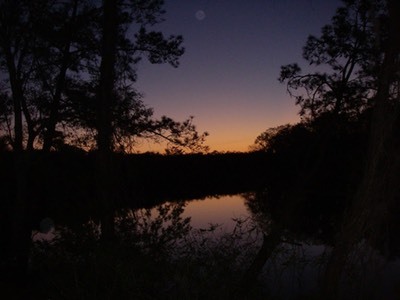 March 21 - On to Ochlockonee River State Park: Yesterday’s clouds lifted and the clear night sky was filled with stars. This of course probably meant a cold night. It was. I slept fitfully, with cold penetrating my sleeping bag from time to time. I didn’t roll out till after 7 AM. I quickly completed my usual routine. Then, wearing long johns, two polartec sweaters and polartec pants, I headed off for coffee and breakfast. This was to be a short distance day, only seven miles, so no one was in a hurry to leave. I got on the water about 9:15 AM. It was still a cold forty plus degrees, so I wore my paddling jacket and pants over a swim suite, wicking shirt and light polartec sweater. As on many other days on this trip, our morning started out cold and gray, but this day was especially cold with a sharp wind blowing. 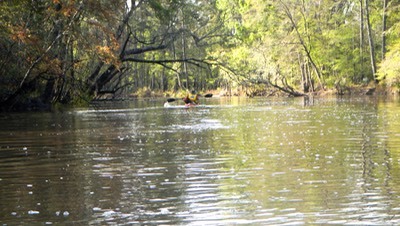 The river was broad and open along this stretch, which made for easy paddling. It was the kind of morning when you could establish a rhythm and let your mind drift to where it wanted to go. 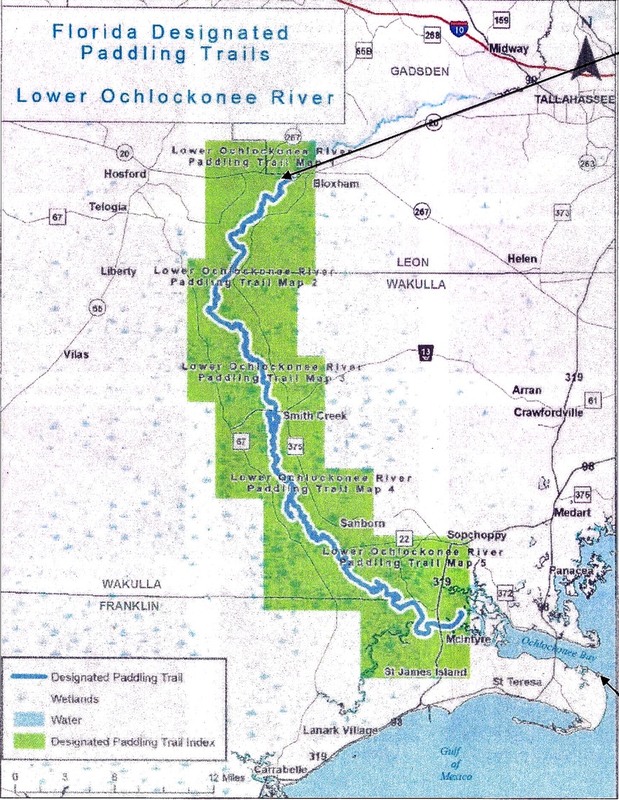 Before I knew it, I’d traveled three miles and was at a junction where the Crooked River meets the Ochlockonee. 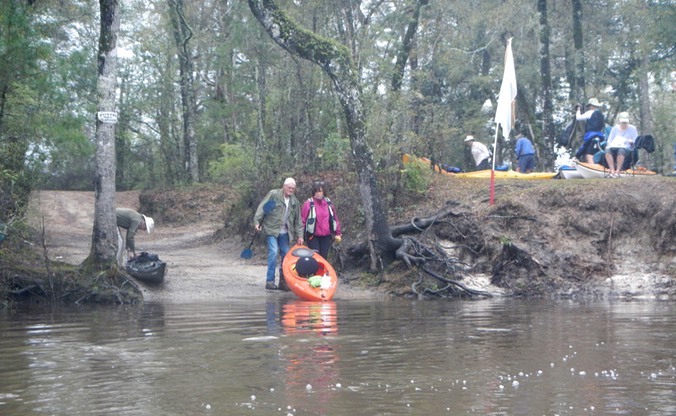 To stay on the Ochlockonee required a left turn. I made a hard right and headed into the Crooked River. I had been thinking about doing this for quite some time. 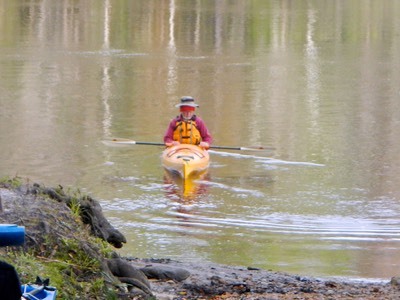 The distance to the state park was less than four miles now, just another hour of paddling. If I kept going I’d be in camp well before noon. So I headed up the Crooked River alone with Lisa (my wife) sitting on my shoulder, bawling me out for heading out solo, not telling anyone what I was doing. 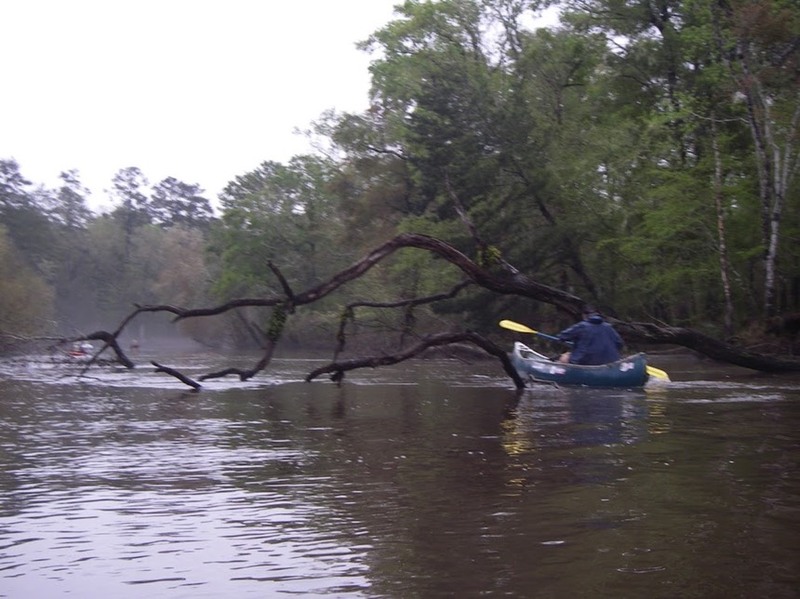 The Crooked River is wild and almost without signs of civilization. It’s hard to explain how it’s different from the Ochlockonee, but it definitely has a different feel. Paddling there was a great choice! 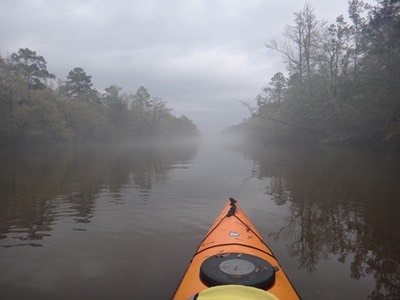 My plan was to explore the first 1.5 miles of the river before turning around, adding three miles and most of another hour of paddling to my trip. 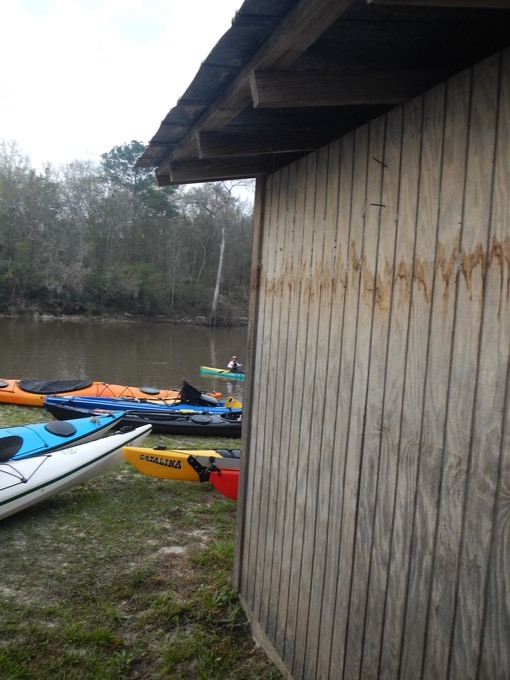 I actually paddled 2.5 miles adding five miles to the seven miles between camps, or twelve miles in all for the day. 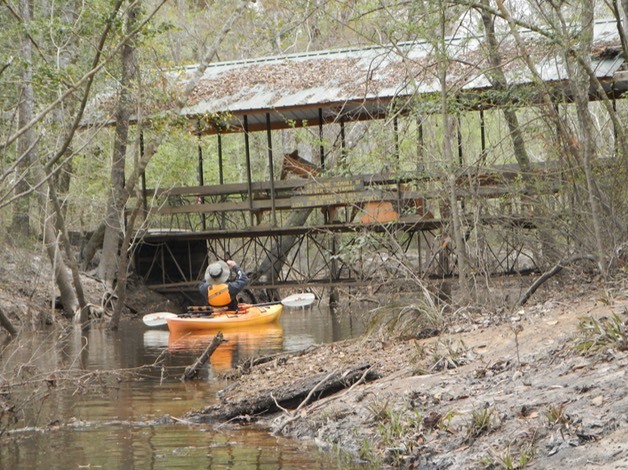 About one mile upstream I spotted a crude boat ramp. Closer inspection revealed a picnic table and a fire ring. 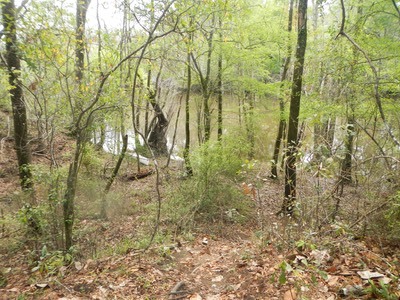 It was marked as a state forest area and looked like it could be used as a wilderness camp site. 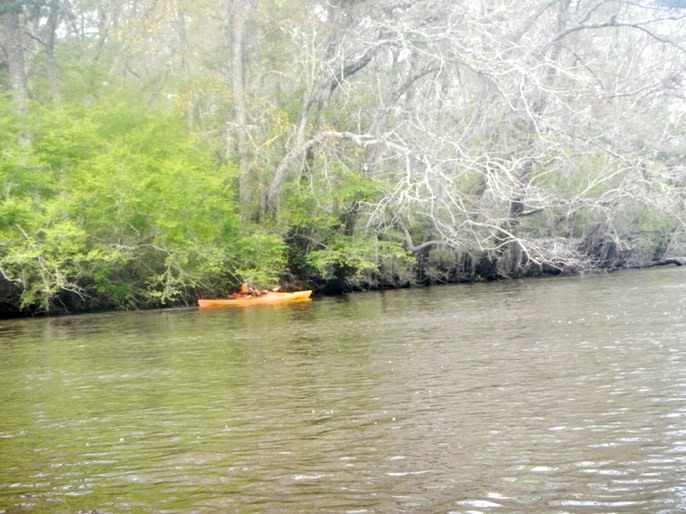 After paddling another half mile I became aware of a paddler behind me. I slowed down and Christine paddled up in her little ten foot plastic boat. 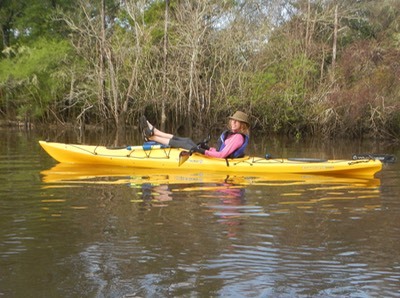 She had followed me up the Crooked River not realizing it was not the Ochlockonee. I told her of my plan to go on for another mile or so before turning back. She decided to join me, mostly, I think, because she didn’t want to paddle alone and was concerned that she might get lost. It was good to have her company, if only to quiet Lisa’s persistent admonishments. We paddled on for another mile, separated by some distance, enjoying the solitude of the wilderness. It then dawned on me why this river seemed so different -this river hadn’t flooded! Flooding must have been the reason why we saw so little wildlife on the Ochlocknee, for we saw abundant wildlife on the Crooked River. 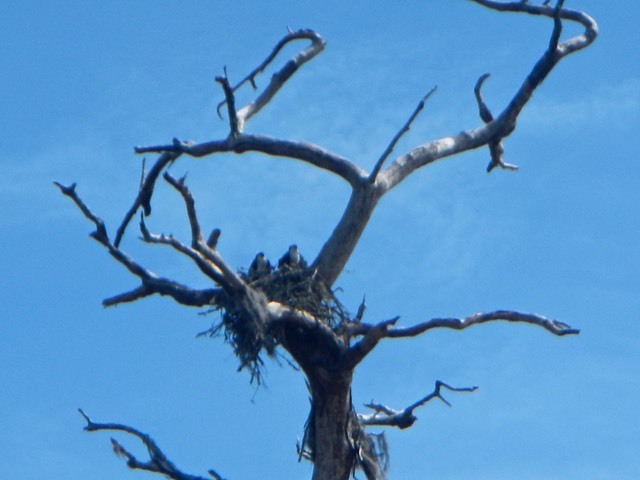 We saw a magnificent Great Blue Heron, an Egret, Banded King Fishers, a Bald Eagle, two Osprey chicks on their nest, turtles - more wildlife in that five miles than we had seen in the whole sixty or so we had paddled so far! As we passed by the state forest ramp again, I spotted a vehicle, some men in yellow uniforms and wisps of smoke beginning to rise from the forest. We had come upon forest service workers starting a prescribed burn. We watched fire drip from the burn pots they were carrying, onto the debris on the forest floor. Soon there was smoke and then flame as the burn got underway. 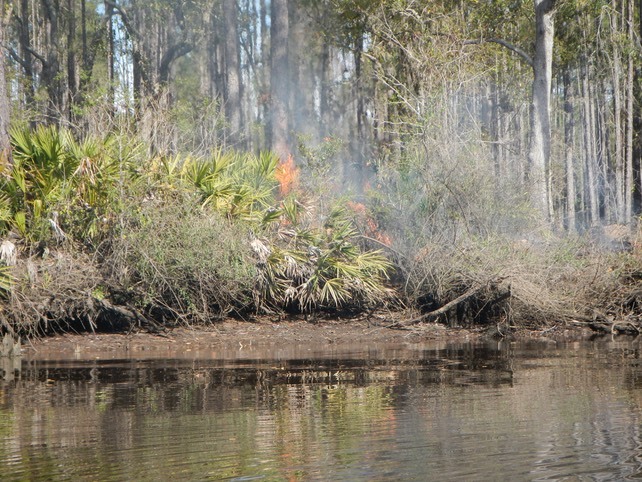 I had seen the results of these prescribed burns before, but never the initiation of one. After a little hunting, we arrived at camp around 1:30. Camp was on a high bluff above the river, and looked like a park from the water. But there was no flag or Penske truck or campers to be seen. I paddled close enough to spot Tray and asked where the pullout was. He directed me to the backside of the park where I found the flag, the Penske and the campers. 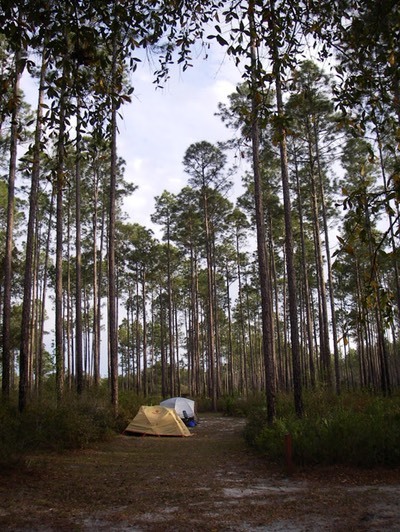 Camp was in a beautiful mixed Slash Pine and Live Oak forest overlooking the river on three sides. Lunch was underway as we arrived. Jan had gone all out and purchased boxes of iced raw oysters that several people were shucking while others slurped them down by the dozen. Some oysters were steamed for those didn’t want them raw. 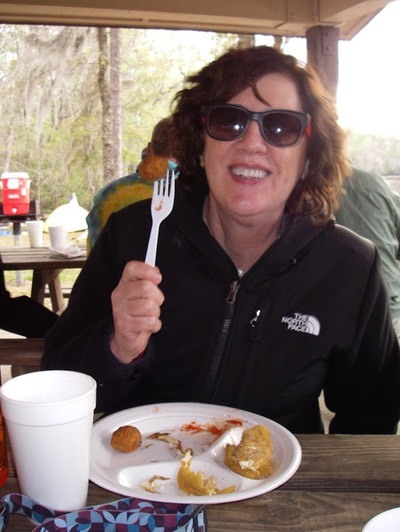 Unfortunately, a bad experience with Oysters Rockefeller, has me enjoying only lightly fried oysters. I settled for a hot dog. The afternoon turned out to be sunny and dry with high “mackerel scale”clouds and a strong breeze. Temperatures were in the 60’s, but the sun was warm. 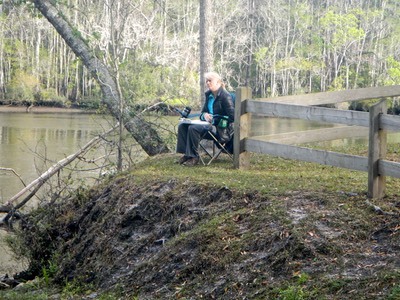 Once my tent was up and my gear stowed I sat in my chair and surveyed a pastoral scene. Paddlers were scattered about at tables talking, while a group of men played a tossing game I didn’t recognize. Other folks laid on the grass or were snug in their tents, napping. Some were out walking, exploring the park. Some were sitting in the shade, reading. In front of me was the creek where I landed, bordered on its far side by a sawgrass marsh that was ringed by trees in the far distance. It was a beautiful spot and one of the nicest afternoons we’d had on this trip. 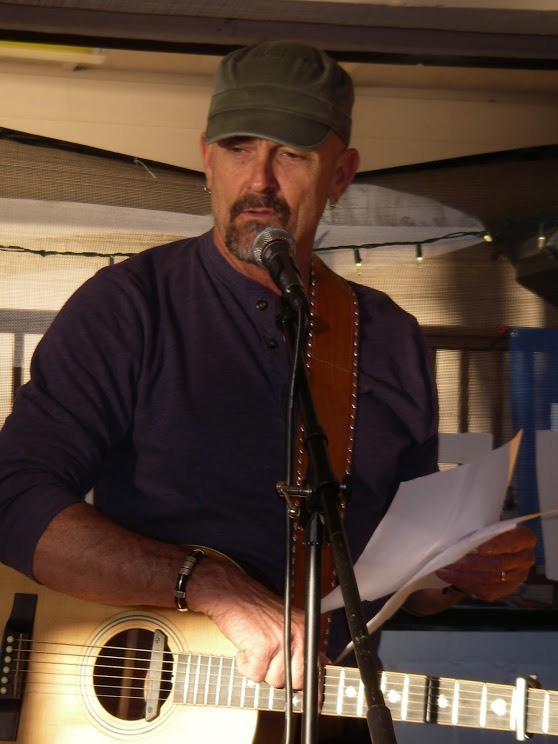 After another hearty meal by Doobie and company, we were entertained by Frank Lindamood who’s music can best be described as American Roots Music. 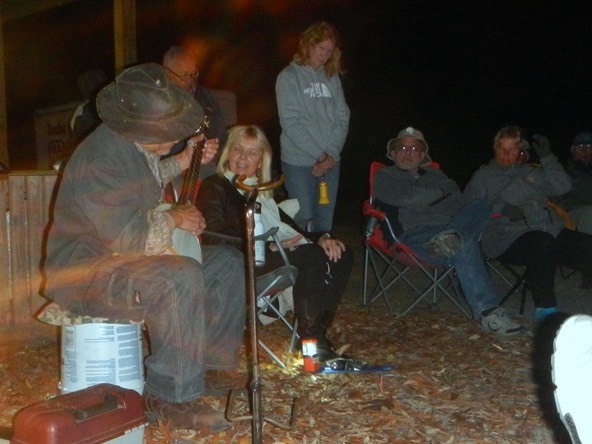 Frank was accompanied by a poet, Donna Decker, who recited several poems in the perfect dialects of Florida Redneck and Jersey Boy. She was very entertaining. Check out Frank's video below. I was off to bed after the show. 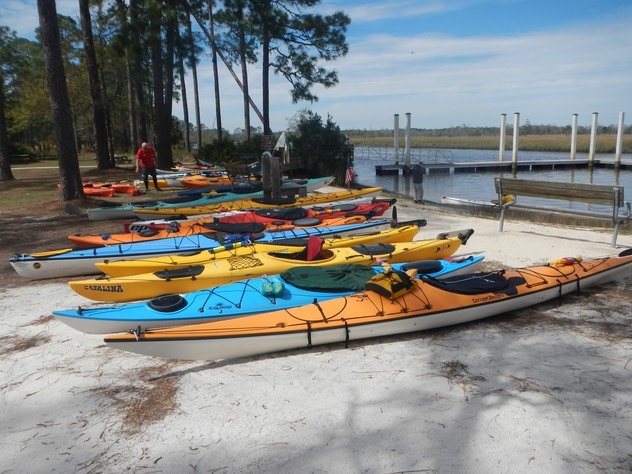 It looked like we could expect another cold night before our last day and our paddle out onto the open water of Ochlockonee Bay. "Red sky in the morning, Sailor take warning." March 22 - On to Bald Point State Park and Trip’s End: There is so much to say about this day that I will expand upon it on subsequent pages. In summary, the day dawned cold and windy. We expected 10 - 15 MPH headwinds. Instead we got nearly double that. Along with this headwind we faced an incoming tide pushing against the out flowing river’s current. This meant a steep chop at best. A few paddlers had wisely opted to drop off of this last leg. 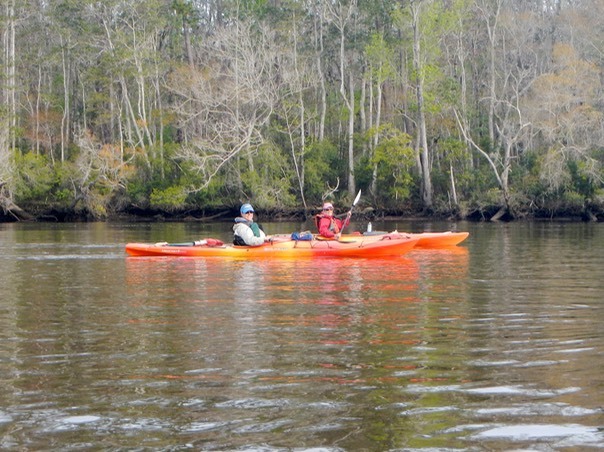 The rest of us headed down the last three mile stretch of river toward Ochlocknee Bay. Winds on the river were strong, stronger than predicted, but there was no wave action there so we covered the distance in an hour. We all paused at the entrance to the bay. Conditions looked bad. Waves were short and steep, topping two to three feet, with lots of whitecaps. One or two paddlers thought about turning back for camp, but did not because they thought no one would be there to assist them. Others, feeling committed and with no other obvious option, headed out into the bay. 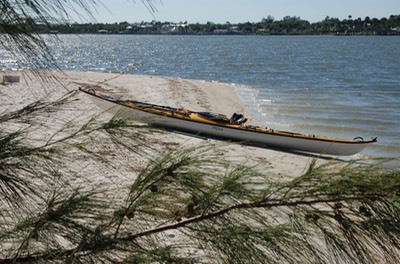 It was recommended that we paddle along the left shore to avoid oyster beds on the right, crossing to our lunch stop from left to right at the base of the bridge some six miles away. The left shore appeared to be in the lea of the wind so I headed there. I wasn’t sure how I would make the crossing at the bridge, but that was a couple of hours away at best. I’d deal with that at the time. 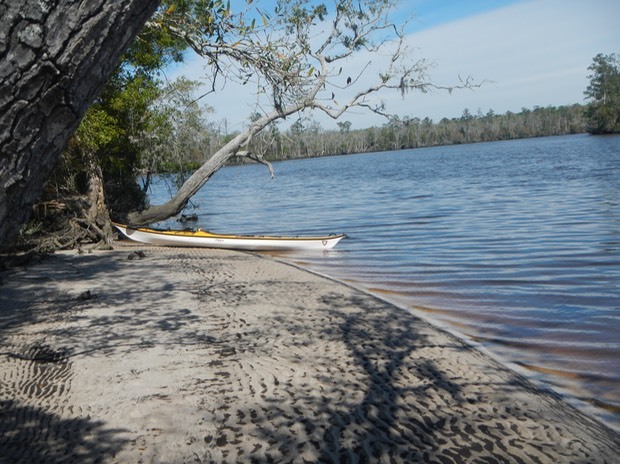 Paddlers were badly strung out along both shores, many essentially paddling alone. Ellie called out from somewhere behind me and asked that I stay with her. Her small boat had low freeboard and only a splash deck. I had no idea how I would rescue her if she swamped or capsized, and I knew she couldn’t rescue me. I slowed my pace as best I could to keep her in sight as we struggled through a steep quartering sea some .6 miles to the lea shore and calmer water. I was taking water over my bow and across my spray deck. I’d been in worse conditions before, but not alone and not shepherding someone in a boat ill equipped to handle the conditions. We pushed on in this somewhat calmer water, still battling the strong headwind. After two more hours we had only gone another three miles. That meant three more miles to the bridge and and three more beyond that to Bald Point - another four hours to reach the takeout at our current pace if our muscles could hold out and if we could stay upright. Ellie spotted a sign for a marina and said she couldn’t go any further. I told her to go ashore and call for a shuttle to pick us up while I stayed on the water to corral those behind us who also wanted out. I collected about nine paddlers in all but no Ellie could be found. Apparently the first person she saw on land was a sheriff who packed her and her boat into his truck and took her to Bald Point where she had a shuttle sent to fetch us. Waiting for a shuttle after bailing out at a marina. Other paddlers found their own ways to get off the water. Hans and Christine went ashore at a private home and used the phone to get help. 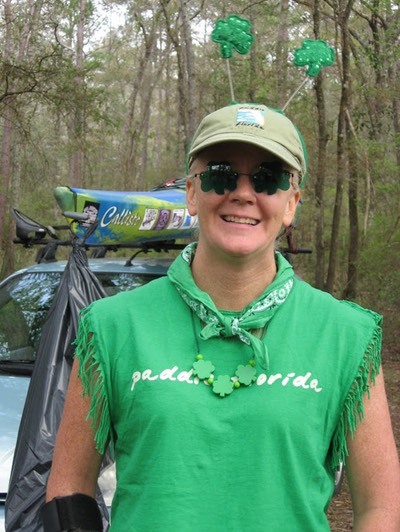 Linda flagged down some fishermen and paid them to taker her back to Bald Point for her car. Many people who took the right shore seemed to have an easier time of it and managed to make it to the lunch spot beneath the bridge. 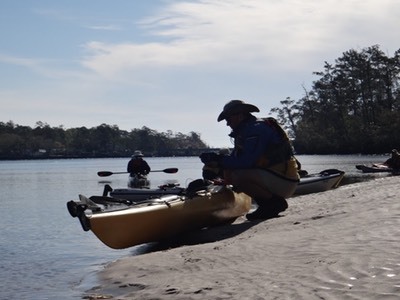 Only one paddler, Eric, made it to Bald Point by kayak, and I understand he was pretty shaken by the experience. We did have one capsize. He was rescued by folks from shore. This was a difficult day, frightening for some, exciting for others. Some who expressed fear initially, later expressed a new self-confidence. 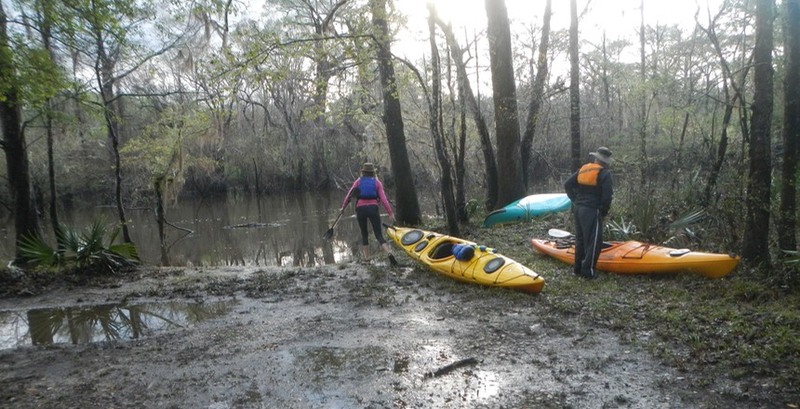 But almost without exception the paddlers showed great resourcefulness in assessing their own capabilities and finding ways to take care of themselves.